For commemorative British stamps, the big event of 1937 was the Coronation. The Duke of York, Albert Frederick Arthur George, had been proclaimed king on December 11, 1936. 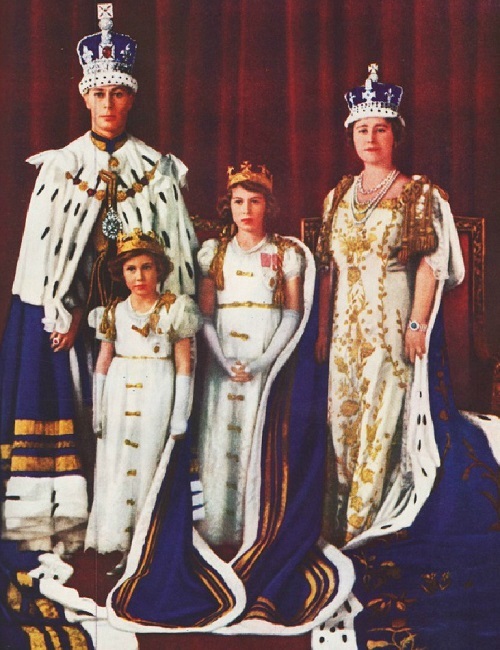 The coronation ceremony was set for May 12, 1937 in Westminster Abbey. Perforation: Perforated 14 1/2 x 14 or 14 x 14 1/2. 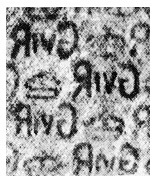 Watermark: WMK 251 (see above). This 1 1/2 P. denomination commemorative stamp (Sc. 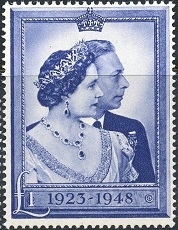 #234) was issued on May 13, 1937 to celebrate the Coronation of King George VI and Queen Elizabeth. The design features the facing portraits of the royal couple, with the coronation date at the bottom. The six commemorative British stamps shown above (Sc. #252-257) were issued on May 6, 1940 to celebrate the 100th Anniversary of the First Postage Stamp. These lovely designs feature left facing cameo-like profiles of Queen Victoria and King George VI. Bisected examples of the 2 P. denomination were used in Guernsey in late 1940 and early 1941. The two commemorative British stamps shown above (Sc. #264-265) were issued on June 11, 1946, to celebrate the Return to Peace at the end of World War II. The design of the 2 1/2 P. stamp features an olive branch, with symbols of peace and industry in each of the corners. The 3 P. stamp features the Dove of Peace carrying an olive branch, with symbols of peace and industry below. The two commemorative British stamps shown above (Sc. #267-268) were issued on April 26, 1948 to celebrate the 25th Anniversary of the Wedding of The Duke of York to Lady Elizabeth Bowes-Lyon. The designs feature a conjoined portrait of the royal couple. This set of commemorative stamps included a 1 Pound denomination stamp, a very high denomination that was unusual for British commemorative postage stamp issues of the time. The 2 1/2 P. denomination was intended for postal use, and it was sent to all British post offices. The 1 Pound denomination was primarily intended for sale to stamp collectors. As a result, over 147 million of the 2 1/2 P. denomination stamps were sold, whereas only a little over 419 thousand of the 1 Pound denomination stamps were sold. Proposed designs were submitted, featuring the royal couple on either side of a view of Windsor Castle, but they were rejected by the king, who preferred the simple conjoined portrait design. The two commemorative stamps shown above (Sc. #269-270) were issued on May 10, 1948 to celebrate the 3rd Anniversary of the Liberation of the Channel Islands from German occupation. Both designs feature depictions of "Vraicking" or "Gathering Seaweed". Vraic is a Norman dialect term for Seaweed. This type of seaweed from the Channel Islands is processed into an organic fertilizer. These stamps were primarily used at post offices in the Channel Islands. The four commemorative stamps shown above (Sc. 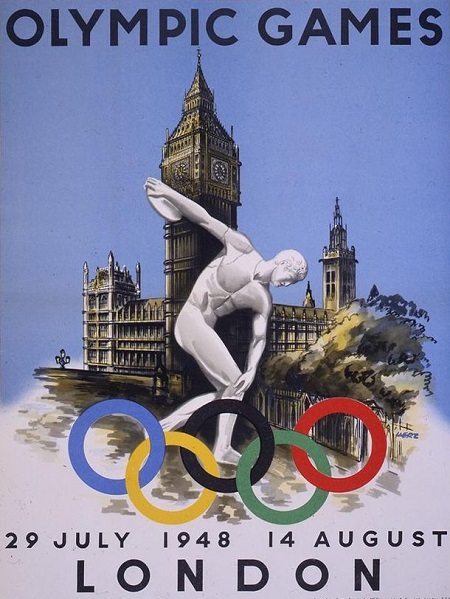 #271-274) were issued on July 29, 1948 to celebrate the 1948 Summer Olympics, held in London from September 21 through October 6 of that year. 2 1/2 Pence - World Globe and Laurel Wreath. 3 Pence - Allegory of "Speed". 6 Pence - Olympic Rings. 1 Shilling - Winged Victory. These were the first Summer Olympic Games held since the Berlin Olympics of 1936. The 1940 Olympic Games, scheduled for Tokyo, and the 1944 Olympic Games, scheduled for London, were both canceled, because of World War II. Germany and Japan WERE NOT INVITED to participate in the 1948 Summer Olympic Games. The Soviet Union was invited to the games, but they did not send any athletes that year. Due to the economic climate and post-war rationing in Britain, these games have been referred to as the "Austerity Games". No special venues were built for these Summer Olympics, and most of the events took place at Wembley Stadium. The male athletes were housed at nearby military bases, and the female athletes were housed in London area colleges. The 1948 Summer Olympic Games were the first to be shown on LIVE TELEVISION! The four commemorative stamps shown above (Sc. #286-289) were issued on October 10, 1949 to celebrate the 75th Anniversary of the Universal Postal Union. All four of the designs feature the left facing profile of King George VI, along with symbolic representations of the UPU or Universal Postal Union. The two special event stamps shown above (Sc. #290-291) were issued on May 3, 1951 to commemorate the 100th Anniversary of the Great Exhibition of 1851 and to publicize the Festival of Britain, held throughout the United Kingdom during the Summer of 1951. The following links feature category-focused affiliated seller listings on various eBay sites worldwide. They may enable visitors to shop for and to buy specific items for the particular collecting subject they've just read about. Remember that the lots on European eBay sites are priced in BRITISH POUNDS OR EUROS. Shipping charges may be more, and the lots may take longer to arrive. Also, make sure the foreign seller ships to your country, before bidding on or buying his lot.